The path, which had to be made, to bring the restoration profession into its current state, was complicated, long and arduous. To reach the present high level of professionalism, it was necessary to overcome gradually all the various obstacles and problems, sometimes through trial and error, under conditions, which were offered by actual socio-historical development. The beginnings of restoration in our parts can be found in the 19th century, when in fact there was a European scale onset of increased interest in cultural heritage and antiques. Primarily they were theorists and art historians (such as Viktor Myskovszky, Imrich Henszlmann, Arnold Ipolyi, Peter Gerecze and others), who began to be intensively interested in the possibilities and ways how to preserve this heritage for future generations, how to improve its state and meliorate its presentation. They pointed out the poor state of numerous monuments, already outlining the theoretical solutions for their recovery and restoration. Understanding the true gravity of the issue of protecting cultural heritage is reflected also in the gradual building of specialized state institutions, which were assigned with this mission (since 1850 it was the Central Commission in Vienna, from 1872 the Provisional Committee of Historical Monuments – for details, please, refer to the section Protection of Monuments in the Past), and at first attempts to formulate the relevant legislation (in 1881 a law on maintenance of monuments was issued). In this respect, in the second half of the 19th century, professional restoration as a specialistic method of recovery of art works in particular slowly emerged, however it was not yet a proper restoration in its today’s perception (besides the given meaning the term ‘restoration’ is also used to describe renewal of monuments in general). The second half of the 19th century was dominated by purist tendencies. Purism as an original effort to restore the medieval monuments in their original style and in a ‘pure’ stylistic expression, were transformed into a comprehensive approach towards rehabilitation and restoration using a method of preference for ‘pure’ form at the expense of the original material substance. Damaged or inadequate originals, which did not correspond in style or were ‘unfashionable’ were replaced on a large scale, sometimes even collectively, by reconstructions using a new mass. These substitutes were often only theoretically invented fabrications, they were non founded by the actual knowledge of the original work. In the best case, the new form matched the original, so the form was preserved, but the material was new. Besides these radical purist interventions, which took place mostly at the level of qualified and well-known artists, specializing on recovery and restoration of monuments (such as Franz Storno or Stefan Groh), significant damage to monuments was caused by numerous ‘recovery’ and ‘restoration’ efforts carried out by mediocre artists who did not have the necessary qualification or skills. Their efforts to reform, complete or improve works in the spirit of the existing aesthetic views and tastes, limited by their ability, respectively inability, transformed a number of works into an ‘aesthetic awe’ or ‘kitsch’ and their value was significantly degraded. In addition to this, often happened that the use of inappropriate materials and technological processes caused that works were degraded also in their technical condition, unfortunately, sometimes these interventions were indelible and irreversible, what led to a definitive deterioration or destruction of original works. At that time there was no vocational education with at least a partial focus on restoration, nor legislation that would regulate the exercise of this activity. The situation improved only slightly in the first half of the 20th century. Still there was an acute shortage of professional capacities on our territory and vocational education still did not exist. 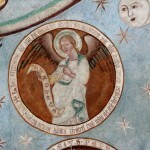 Restoration was carried out by creative artists, among them also some well-known and recognised painters and sculptors (for example Jozef Hanula, Peter Julius Kern, Frantisek Zenisek, Peter Mendel and others) who acted both – in good faith and in an effort to contribute to preservation of cultural heritage – and due to economic reasons – as restoration was for them often the only important source of livelihood. 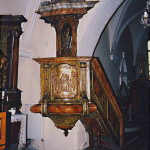 As the economic situation in Slovakia was not favourable for extensive and technically more demanding restoration, still numerous unknown or little known artists and craftsmen, often without the necessary qualifications and skills, were the ones who could work on reconstruction and restoration. Therefore the deterioration and degradation of original works’ values persisted, however, not to the previous extent. The supervision of the state became more competent by employing specialistic units (Government commissariat for monuments protection in Slovakia, and from 1923 the State department for monuments protection in Slovakia), although even these bodies started their activity with great difficulties and with a shortage of skilled professionals. However, the theory and methodology of cultural heritage protection advanced. In response to purist restorations during the 19th century, a reversed, preservational theory of Alojz Riegel emerged, which emphasized the rescue and protection of authentic materials at the expense of form. So restoration of works started to be approached by the method of presenting and preserving the original by minimising or completely excluding the reconstruction. So the preserved form of artworks was maintained even in case of damage or incompleteness, eventually also with the more recent layers, which were already present on the surface. This new approach was definitely a major step forward as in practice it meant a drastic elimination of the irreversible liquidation of originals and their authentic values. This method was promoted also by the leading figure of the Government commissariat and the State department of monuments protection in Slovakia, Jan Hofman, therefore it basically became the state policy in the field of rehabilitation and restoration of monuments. By mechanical or rigid application of this method either meaningless or so-called analytical recoveries were carried out, which only conserved and presented relics of all existing layers, or the works remained preserved in their incomplete torso state, not providing the viewer any positive aesthetic impression. However, the new method has a positive summary, as it resulted in fact that original works stopped being destroyed and the approach to authentic creations started to be more respectful, with regard towards what was actually a creation of artists in the past. From there it was only a step towards the so-called synthetic method of recovery and restoration, based on the optimal evaluation of matter and form, which is still applied nowadays and clearly proved to be the most appropriate. After World War II and the year 1948 the situation in the field of reconstruction and restoration was disastrous in Slovakia. On one hand there were the severe damages to the cultural heritage caused by the war and the chaotic post-war situation, on the other hand a huge number of monuments, historical buildings, art works and objects, which became state property after confiscations and nationalization. The state was unable to cope with this situation, it even could not; to protect and restore monuments in such extent it would be necessary to dispose with an enormous team of experts and, of course, with the necessary finances. The situation could not be managed neither by the under-equipped state supervision team lacking both – capacities and expertise, which was after the year 1945 under the responsibility of the Ministry of Education and National Culture, and its National Cultural Commission subjected to the previous and subsequently under the responsibility of regional national committees. Slovakia despaired, it lacked professional and personnel potential in both – conservation and restoration ambit. Still there was no professional education and if restoration activities were carried out at all, they were still assigned to various well-known or unknown artists. The urgent need of qualified restorers was also evident from the fact that when in 1949 the University of Fine Arts was established, among its four founding subjects the Restoration specialisation of the Prof. Karol Vesely was one of them. The existence of the school was an essential step towards the formation of professional restoration in Slovakia, and since its launch, the history of actual restoration on our territory began to be written. However, the natural process of its constitution needs time, therefore still for a number of following years the restoration was carried out by creative artists, sculptors and painters, who did have art education, unfortunately not aimed at restoration, but on free artistic creation (among them Vojtech Loffler, Jan Rybarik, Mikulas Stalmach, Albert Leixner and others). A fundamental shift in the institutionalisation of protection and restoration of monuments was the formation of the Institute of Monuments in 1951, where also restoration and technological sections were inserted. The construction of restoration workshops with the necessary technical personnel equipment was costly and time consuming, and therefore it require more time. The period between 1948 and 1989 was very controversial and difficult. At that time the evaluation of restoration activities, naturally, had to be tendentious and marked by a mandatory ‘building enthusiasm’, praise and effort to conceal shortcomings. After-coup evaluations are on the other hand marked by negativism and frustration, as well as with the tendency to deny anything positive that was achieved during that period. The whole epoch still needed a truly professional and objective hindsight evaluation. In any case it must be recognized that in the 50s all the necessary basis were laid for the establishment of qualified restoration activity – a professional education system as well as a professional state institution for the monument care were founded, and also the legal framework was established – in 1958 the Act No. 7/1958 Coll. of the Law on Cultural Heritage came into force. This law was already appositely dealing also with conservation and the restoration of monuments, and its benefit was (except for its very existence) above all the fact that it codified the range of persons and organizations, which were authorised to carry out the conservation and restoration: “Preservation and restoration of monuments of arts as paintings, sculptures and artistic crafts may be carried out only by professionally qualified restorers. In the case of artistic crafts, preservation may also be carried out by professional establishments, cooperatives, etc. registered on the basis of a declaration made on behalf of the Association of Slovak Fine Arts and the Institute (Institute of Monuments – note of the author) to the list, which is conducted by the Ministry of Culture of Slovak Socialist Republic…”(article 25 point 1) “The Ministry of Culture of Slovak Socialist Republic can… set up studios, workshops or establishments, which might be legal entities, for carrying out preservation and restoration of monuments.”(article 25 point 2). As it is evident from the text, in an effort to abolish unprofessional amateurish “restoration” and damage and destruction of monuments, the law established a clear and precise platform. Naturally, the practical application of this statutory provision was complex and problematic, especially because efficient control mechanisms were lacking (mostly capacitive). However, this was not any more a problem of legislation, which is to be considered a positive one, particularly with regard to the given period. 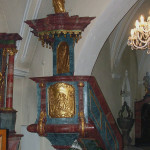 In addition to restoration workshops set up in museums and galleries, which treated, conserved and restored collection objects on the basis of apposite legal provisions, the restoration of monuments in respect of law was carried out primarily by independent restorers through the mediation of the Slovak Fine Arts Fund and its establishment called Dielo, as well as in premises of the Institute of Monuments. The institute had a restoration unit, which existed until 1975, when for the purpose of restoration and artistic renewal another enterprise was established, known under name of Headquarters of Arts and Crafts, which also embosomed restorers of the Institute. The technology and research section remained within the institute. Despite various problems of organizational and technical character, but also financial and especially capacitive problems when the institute constantly struggled with a shortage of skilled art restorers and artisans, a number of successful restoration actions were realised there, and it managed to save and restore many monuments and entire sets (28 altar units and iconostasis, 15 altar paintings and icons, 13 altar statues, murals in 13 objects and others). Among the staff of the department there were numerous professionally qualified restorers, such as Alzbeta Darolova, Gabriela Englischova, Milan Gregus, Ladislav Chamutti, Michal Staudt, Andrej Kuc, Maria Marianiova, Eva Ricottiova and others. In course of some years the institute developed a restoration workshop with good material and technical equipment including a physical and chemical laboratory, what gradually improved conditions for quality performance of restoration activities. In 1981 further organizational changes occurred. A new independent organization was founded – the State Restoration Studio with five regional studios, which has already been specialized in the restoration of cultural monuments, including the initial research and documentation. Therefore the research chemical and technological department as well as the department of graphic documentation were transferred here into this specialised organisation. In 1987 the antiquities act was amended, the Act No. 27/1987 Coll. of the law on state monuments care and a little later also its regulatory decree, the Act No. 21/1988 Coll., which for the first time codified the principles of restoration documentation processing, entered in force. From a certain point of view, this act on providing the restoration activity was a step forward, because it stated that “the restoration of cultural monuments or of their parts, which are visual art works or works of art crafts can be carried out only by professional socialist organizations established for that purpose by the Minister of Culture… Other socialist organizations can carry out these works only if an apposite authorization was granted to them by the Ministry of Culture … “(article 14 point 8). This new regulation was, especially from side of self-employed restorers, strongly perceived as discriminating and as a deprivation of their own creative freedom. The negative impact of this act cannot be denied. As a result, all restorers, who wished to continue working on the conservation of monuments, had to get engaged in a socialist organization and work under specified time, performance and financial schedules which certainly did not motivate them to increase the quality of performance nor did it create a positive attitude towards work. This prohibition to perform restoration as a free profession had negative consequences also for the continuity of restoration process as a sovereign discipline, the free creative field for performing freely the restoration activity was limited, new conditions were not satisfactory for numerous restorers, who were before carrying out their activity as freelancers. In state studios as well as in restoration units of museums and galleries the work continued continuously, and it cannot be regarded as not being successful. Several high-quality restoration recoveries were carried out, even though funding the restoration of monuments, a great part of which had a sacred nature, was certainly not of a high priority to the socialist power, and therefore it stood in the background. This difficult period was relatively short, but even after the revolution of 1989 change did not occur very rapidly. Complicated relations and the necessity to radically and fundamentally address all areas of social life, did not permit immediate solutions in the field of monument protection and restoration. Naturally, this area was not seen by the society and top state authorities as a priority for the functioning of state and the life of population. A shift for the better, therefore, required time. 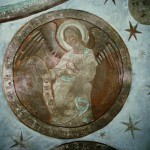 This project is realized with the support of the Ministry of Culture of the Slovak Republic.